Ride the waves on your surfboard, a fun surfing experience in the serene Arabian Sea in Mumbai. A 4-hour long session, with surfing lessons by experienced surfers. An off-beat experience amidst all the hustle and bustle of Mumbai. Company of experienced surfers and good quality surfboards. India is blessed with over 7000 km of coastal region with unexplored waterfronts. One of the best ways to explore the sea is to master coastal knowledge and coastal adventure activities. Swim and Surf the Waves with us and expose yourself to unknown territories and new stories to be told. Surfing is a sport with multiple interpretations. For many, it's a recreational activity, physical activity, and a competitive sport, but for others, it is a religion, a lifestyle, an addiction, and a spiritual connection with Nature. India may be the last to get into surfing but the surf potential in India is already proving to be amazing! Learn to ride the Waves with us and get your basic strong so that you can travel to the many beautiful international surfing destinations in India waiting for you. You are required to report at the meeting point in Virar, Mumbai at the timeslot selected while booking. Upon arrival, you will be changing into surfing clothes and be getting ready with the board. Head to the beach to start with the briefing and a training lesson with your instructor. You will be accompanied by the experienced surfers who will take you through the briefing process. The initial lesson will be on the sand. After you have mastered some of the important skills, its time to try out the lessons in the waters. Enjoy surfing in the Arabian Sea for 90 minutes with an instructor. On completion of the session head back to the showers to freshen up and change into fresh clothes. You are free to rest at the club for a while or can leave to head back home. A training session with an expert instructor. 90 minutes of surf session with our expert instructor. All required equipment (surfboard and leash). Life jacket, if required by the guest. Use of showers and washroom. Please ensure that you reach the meeting point well in advance to the reporting time which will give you sufficient time to change into surf wear and get ready with the gear. Breakfast can be served before or after the surf lesson at an additional cost. Payment for the same can be made directly at the site. Board shorts and rash guards are the most ideal wear for surfing. However, guests can also wear swimsuits or any synthetic shorts or t-shirts which allows free movement of the body. Guests are requested to carry their own towels. It is advisable to carry waterproof sunscreen. Changing rooms are available on the site. The maximum capacity of each group is restricted to 6 to ensure a private and personalized experience. The minimum age for participate in the activity should be 4 years. We require minors to be accompanied by adults. Report at Virar, Mumbai, Maharashtra. 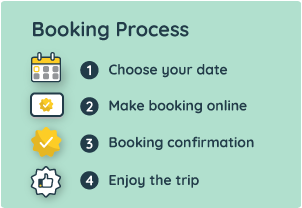 The complete reporting address, local contact person details and phone number are shared in the booking voucher, sent to you via email on booking completion.